“What are mushrooms doing in my coffee?” I wonder as I sit in my Holistic Nutrition class looking at the beverage I grabbed from Whole Foods to satisfy my caffeine craving earlier this morning. I was half asleep when I plucked the first bottle I saw that said “cold brew” from the seemingly never-ending wall of drinks in the refrigerated section. It is only later that I realized I picked up REBBL’s, Reishi Mushroom cold brew coffee. The drink had the familiar deep taste of coffee with earthy notes and some creamy sweetness, but the most intriguing element was that I was drinking fungi! I love trying different food concoctions, but what’s with the mushrooms? Is this a thing? My thirst was quenched, but my curiosity was peaked. I looked on REBBL’s website and found that they describe the reishi mushrooms as an “adaptogen” that “decreases the flood of stress hormones into the body.” Hmm, that sounds too good to be true. I reached out to Rivkah Khanin, a Bay Area mushroom enthusiast who forages her own mushrooms and cooks up many culinary creations with fungi. I was interested in learning more about the royal kingdom of fungi and how I could incorporate them in more than just my coffee. How did you get into mushrooms? My whole family is from Russia and I have very vivid memories of going mushroom hunting as a kid. Five years ago I tapped back into that passion when I started working at a farmers’ market mushroom stand in Baltimore, that’s when my obsession with fungi really flourished. Actually, mushrooms are a big reason why I moved to the Bay Area. There is so much more community around fungi here and a longer foraging season. How long have humans been using mushrooms? Mushrooms have been used for thousands of years around the world in traditional Chinese medicine, Russia and even Otzi, the iceman who lived in 3,300 BCE was found to have two different types of medicinal mushrooms on him when he was discovered. So humans have used mushrooms for quite a long time as food, medicine, tinder and even paper. Yeasts are single-celled fungi, so thanks to fungi we have fermentation! Humans have been fermenting food for thousands of years, and we wouldn't have bread, wine, beer, cheese, etc. without fungi. Comparatively, mycology as a field is fairly new and it wasn’t until a few hundred years ago that people differentiated mushrooms from plants. 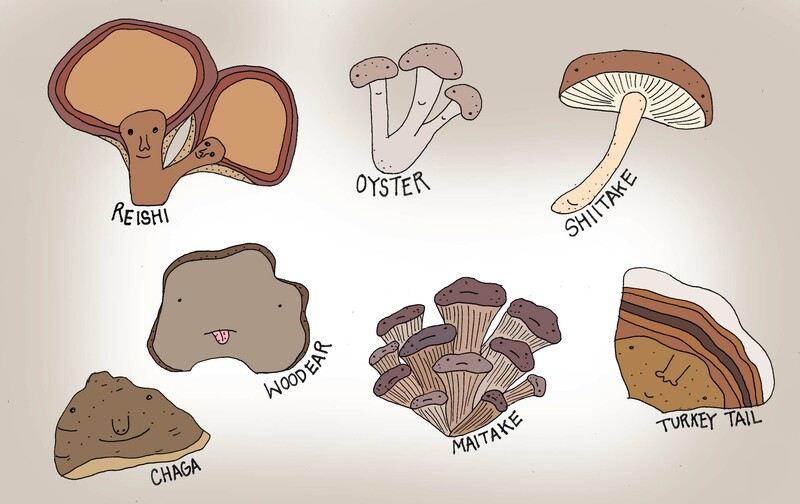 How are mushrooms different from plants? On a cellular level, mushrooms are more similar to animals than they are to plants. They have a dense protein-like substance in their cell walls called chitin that is also found in arthropods and mollusks. Fungi don't have cellulose in their cell walls like plants do and have a different way of getting energy. Mushrooms have evolved to have symbiotic relationships with plants since fungi are not capable of photosynthesis. Fungi act as a decomposer and break down decaying matter, transforming nutrients for plants to take up through their roots. Meanwhile, plants utilize photosynthesis and make carbohydrates that nourish the fungi. "Mushroom" and "fungi" can be used interchangeably, but to be clear, a fungus is the whole organism and a mushroom is just the fruiting body of the organism. Just like the apple of a tree. Most of the organism is underground as mycelium, a web-like hyphal network of nutrient and information exchange. Mushrooms definitely have their own kingdom for a reason. What are some of the most popular mushrooms? I’d say Reishi (Ganoderma lucidum), Turkey Tail (Trametes versicolor), Shiitake (Lentinula edodes), Oyster (Pleurotus ostreatus), Chaga (Inonotus obliquus), Lion’s Mayne (Hericium erinaceus) and there are so many more. Marketing for mushrooms is a big determining factor as to how the public sees them. They are being touted as these new “super foods” and are increasingly found in supplements, beverages and smoothies. A lot is left unaddressed around the preparation and sustainability of using some of these fungi. For example Chaga, is a parasitic mushroom that only grows on birch trees and it is over-harvested and killing acres of forest in places like Russia. I am really happy that mushrooms are getting more into popular consciousness and are being used medicinally. I just want to make sure people are informed consumers and that they also keep in mind sustainability in their choice of mushrooms. What are some health benefits of mushrooms? Some mushrooms have adaptogenic qualities that help the body maintain balance and adapt to stress. They can also nourish the adrenal glands, stimulate the immune system and have been studied to support treatment for certain types of cancers. Reishi, is probably the most researched medicinal mushroom and is very popular in traditional Chinese medicine for its therapeutic effects. I make my own double extractions of reishi and take it medicinally when I feel like I’m starting to get sick. I think that in addition to the ones that are considered “medicinal,” even mushrooms that are considered “gourmet” have a ton of beneficial properties. 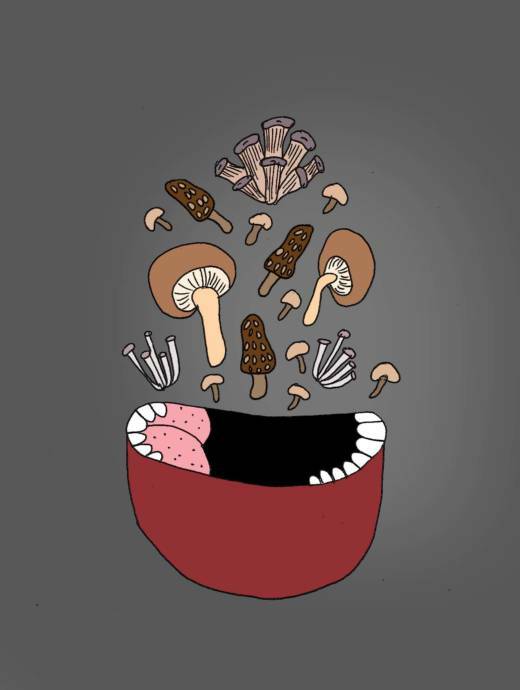 Renowned fungi experts, Christopher Hobbs and Paul Stamets have great resources for using different mushrooms for healing. What are some of the best ways to prepare mushrooms? It’s super important to cook mushrooms! They need heat to break down the chitin so we can access the beta-glucans, which are the immune boosting properties in mushrooms for humans. A common misconception that has been over-generalized from the plant world to the mushroom world is that eating mushrooms raw is better for you. That’s not the case because they are actually really difficult to digest raw, and in some cases toxic. Between you and me I’d like to see less raw slices of button mushrooms in salad bars. How do you like to prepare mushrooms as food? I like simply sautéing mushrooms in butter, such as chanterelle, maitake, oyster mushrooms and shitake. We are really lucky to live in an area where these mushrooms are easy to get either in the wild or locally at grocery stores. One of my favorite dishes to make is a miso mushroom soup (see recipe below). For woodier mushrooms like reishi and turkey tail, you can’t really just cook and eat them because they are super tough. (It’s like trying to munch on a tree.) I like making these mushrooms in a decoction (see recipe below), which is when dried mushrooms are simmered in water for 20-45 minutes and then the liquid is used in soups, stews and beverages. If you have a powerful high-speed blender, you can even blend the previously cooked mushrooms and dehydrate the mixture, making a powder to be used in other recipes, like baked goods. This way, you are getting the beneficial beta-glucans from the mushrooms that have become more bioavailable by cooking. Where can you buy quality mushrooms? Far West Fungi in the Ferry Building has a great selection of fresh and dried mushrooms. They even have kits for you to grow mushrooms at home. And if you’re in the East Bay, Monterey Market and Berkeley Bowl have pretty great varieties of fresh mushrooms. What are good resources for folks who want to connect with people around mushrooms? The Mycological Society of San Francisco, Bay Area Mycological Society and the Bay Area Applied Mycology have great monthly meet-ups, classes and events about mushrooms. This is a great place to start if you are interested in foraging your own mushrooms too. After my chat with Rivkah, I felt inspired to get started exploring all the creative ways I could involve fungi in my life. I also found studies that support mushrooms’ medicinal functions in relation to chronic Hepatitis B and their anti-tumor potential. Maybe I can forget the coffee and just go straight for the mushrooms. Their adaptogenic qualities may give me a more supportive morning boost. Decoctions are a great way to use woodier mushrooms, such as reishi or turkey tail. Place 2-4 tablespoons of dried mushrooms ground into fine pieces in a medium saucepan and cover with a quart of cold water. Bring the mixture to a boil and then turn down the heat and simmer for 20 to 45 minutes depending on desired strength. Then strain the mushrooms and save the liquid in a jar or freeze in an ice cube tray for easy single servings. Using a mix of fresh and dried mushrooms gives the soup a nice variety of textures. I also tear fresh maitake and oyster mushroom instead of cutting them because I think it seals in the flavor better. Put dried mushrooms in a bowl, cover with boiling water and let sit for 10 minutes. Meanwhile set a pot with 1/2 gallon of water to boil. In another large pot, melt the coconut oil over medium heat, and add the onion, garlic, ginger, and carrot. Add a pinch of salt, stir to coat in the oil, cover with a lid and let cook for a few minutes until the onions are glassy and the carrots are tender. When the water boils add the fresh mushrooms to the pot and stir. Leave them to cook for about 7 minutes with the lid off. Strain the rehydrated (dried) mushrooms, reserving the liquid, and add the mushrooms to the pot, stirring for a couple minutes, then add the mushroom liquid. By this time, your pot of water should at least be steaming—it's okay if it's not boiling yet, you just want it hot so it won't halt the cooking process—slowly pour the water and mushrooms into the other pot. If you like your soups fairly dense you may not need all of the water, if you like thin soups you may need more. Keep an eye on the pot so it doesn't boil because that’s too hot a temperature for the delicate, beneficial microorganisms in miso. Once the pot is starting to steam, turn off the heat, put the miso into a medium bowl, ladle out a half cup of the hot liquid and mix to make a paste. Gradually thin with more liquid, and pour back into the pot. Ladle soup into serving bowls, add tamari/soy sauce, hot pepper sesame oil, and nori to taste, and enjoy. Feel free to experiment! I like to eat this soup by itself or sometimes I serve it over rice or soba noodles I also modify this recipe by adding kabocha squash or sweet potato cubes.